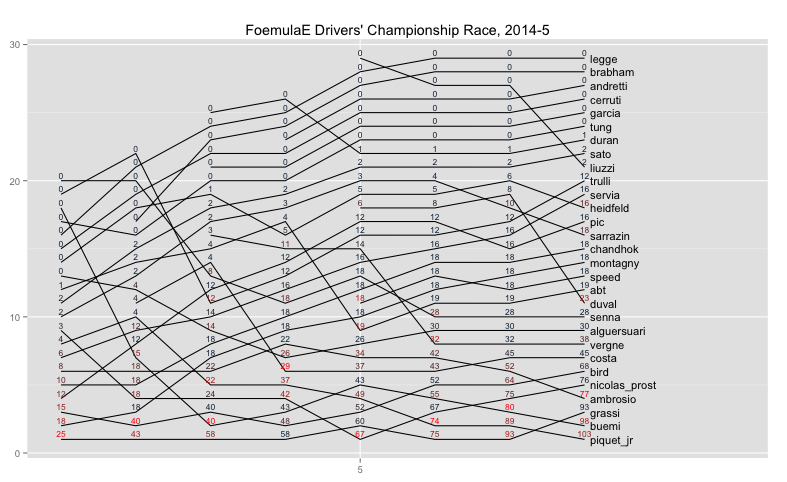 With race results data for the Formula E Championship, as well as Formula One, available from the ergast motorsport results database API, it's easy enough to reuse the code that generates F1 Championship race charts (eg as originally described here) to produce similar charts for the Formula E Championship. Along the horizontal x-axis we have each round of the championship, the vertical y-axis is championship standing at the end of each round. The number represents the total championship points score by each driver at the end of each round, the red colour identifying those drivers who scored points in each round. For more information, see the Wrangling F1 Data With R book.